The last year and a half, HSE has been doing a Pilot and Demonstration Activity (PDA) funded by Asian Development Bank (ADB) in Sitio Pulo, Tanza, Navotas. The objective of the project is to come up with innovative design and planning solutions to support the development of disaster-resilient communities in flood prone areas. 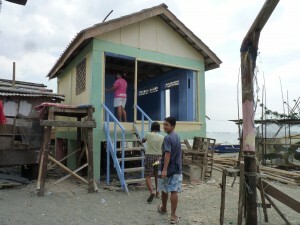 Out of this project, HSE together with the SAMASAISIP, the people’s organization in the community were able to build a bamboo bridge that connected the island to the Navotas mainland, retrofit the community’s old wooden bridge, and build two community facilities namely the livelihood center and multipurpose center. A knowledge sharing forum was hosted by ADB last April. For more information about the forum, please follow this link. For more information about the Pilot and Demonstration Activity Project, please download the project completion report here. Reactions? Suggestions? We’d love to hear from you! Leave us a comment. This entry was posted in Recent Stories and tagged ADB PDA, disaster resilient, Navotas, Sitio Pulo, Tanza. Bookmark the permalink.